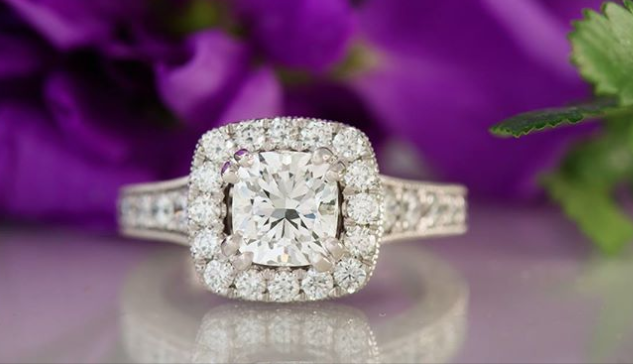 It is possible to get a “big look” even with a diamond that won’t break your budget. Here are seven tips on how to help maximize your diamond’s look in any price range. Although carat weight is an important factor in diamond appearance, it isn’t the only factor. A diamond’s cut is more as important as its weight. A diamond’s shape, proportions, and how well it is faceted all add to the ability for a diamond to make a beautiful presentation. A smaller carat size diamond with a higher quality cut can hold its own against a diamond that weighs more, but is poorly cut. There are several brilliant and modified brilliant diamond cuts that offer the same kind of fire as the round brilliant cut. These fancy-cut gems (oval, marquise, pearl, heart, and princess) are often less expensive, as well. You can often buy a diamond with a heavier carat weight at up to ¼ of the price of a round brilliant diamond. Fancy cut diamonds are a perfect option to get the brilliance of a round cut diamond but at a price that will allow with a higher carat weight. The elongated shapes (marquise, pear, oval, and radiant) give the illusion of a larger gemstone size. They can also make a ring finger look slimmer and longer. A center diamond surrounded by smaller diamond in a “halo” gives the illusion of a much larger diamond. Smaller diamonds are less expensive than larger diamonds. The larger the single stone’s carat weight, the higher the cost per carat. A halo of smaller cut diamonds will be much less expensive than a single diamond with the same face-up size. Diamonds that are showcased by side stones also give a much larger look. They offer additional sparkle to a ring. If you have a smaller solitaire diamond, mount it on a slender band. Smaller diamonds on wide bands tend to get lost. A narrow band will give the diamond the opportunity to be the center of attention. The shine and sparkle of a diamond is brought out when the gem is clean and not hazed by soap or lotion residue. Wash your diamond d=in a mild ammonia and water solution, use a soft toothbrush to scrub away debris, rinse well, and pat your diamond dry on a smooth clot. A ring’s design will greatly affect how beautifully and fully a diamond appears. Turley Jewelers carries a full inventory of engagement and wedding mounting suitable for a variety of diamond weights and shapes. We also can create a ring that is uniquely your own by designing a custom piece. Whether you have the budget for a major diamond or are working with a more modest budget, Turley Jewelers can help you make the most of your purchase with the best ring design for your gemstone. Located in the Pinecrest Village of Miami, Florida, we are at your service.